To the first indigenous people of the Cape, the Khoisan, Table Mountain held a particular sacred significance. There are many stories about the great mountain, and in some of these, the moutain itself is a storyteller, overlooking the surrounding area and telling about what it sees. Looking down from the mountain one can see the Cape coastline weaving a jagged boundary between the land and the sea. Perhaps one of the stories that the mountain would tell would be about the thousands of people that come every year to visit those ephemeral patches of sand that line the coast. If Johannesburg is Egoli, (the city of gold in Sotho and is defined by its most precious resource), then surely Cape Town is no different? Perhaps then Cape Town is the city of silver, her most precious resource being the silver-sand beaches that seem to hold so many in thrall. Two oceans converge at Cape Point and the landmass acts as a separator for the two basic types of beaches. The warmer Indian Ocean and the False Bay coast are the family beaches that offer swimming, surfing, fishing, paddling, walking and all round family orientated entertainment. Most of these beaches are manned by lifeguards and relatively safe for swimming. The False Bay Coast hosts the well-known Boulders Beach where tourists go penguin watching. 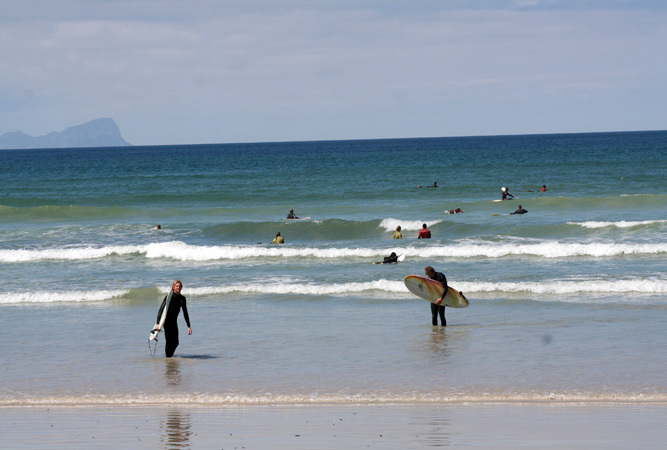 Muizenberg beach is popular with locals and has facilities that are a favourite with the kiddies, including a putt-putt course and waterslides. The stretch between Strandfontein beach and The Strand holds treacherous waters and is mostly the hang out of fishermen. There are more than a few “old men of the sea” in the Cape, and the stories of the coastline that first enticed settlers to build a way-station on her shores are many. The Cape coast has a whole mythology surrounding her, filled with violent storms, valiant heroes and even reputedly mermaids. But those are other stories for other times. Beaches on the Atlantic coast are almost the opposite, with trendy beaches lined by cocktail bars. Definitely geared up for the sophisticated crowd; the beaches stretch from the V&A Waterfront and meander around Table Mountain to the beautiful “Republic” of Hout Bay. Although the mountain gives welcome shelter from the infamous south-east wind, these beaches are ‘cool’ in more than one way. The Atlantic Ocean can at best be described as “refreshing” and has surprised more than one tourist who thought that African water can’t really be that cold. The four beaches of Clifton and Llandudno (often mispronounced by Gaelic visitors, the correct way to say it is Lun-dud-no) are world-famous, during season the beaches are crowded; definitely the place to be seen, great for sunbathing, volley-ball and sundowners. Beaches along this stretch have numerous restaurants and coffee shops that cater to all tastes. The North Atlantic Seaboard (Blaauwberg) includes Bloubergstrand and Milnerton. Beautiful long beaches where the locals go to enjoy the less crowded spaces; excellent for walks, surfing and kite-surfing. The view of Table Mountain from Bloubergstrand has been immortalised on postcards often sent to loved ones from Cape Town’s shores, each one sending a small piece of Table Mountain’s story to people around the world.